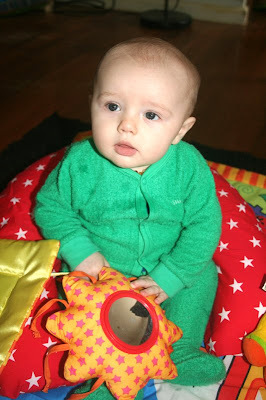 Here's yet another picture of Ari "sitting up" with his boppy pillow. He is soooo happy these days, and sits and plays for 40 minutes at a time, quite happily! He is most happy after school when the big boys come home and he sits in the middle of the loungeroom floor amidst all their activity and busy-ness... Oh and he's in one of his new Bonds Wondersuits with the V-neck (as opposed to the collared neck which I loathe). Even though Ari is really only just into size 00, I bought these suits in size 1, because I tend to dryer dry our clothing and Bonds suits shrink a LOT in the dryer... The suit isn't too small on him, it's just stretched because of how he's seated :)... And finally, this is what 8 loads of washing looks like, hahaha! Taken last weekend, I thought it was funny how dwarfed Dave and Ari are by the mountain of washing! 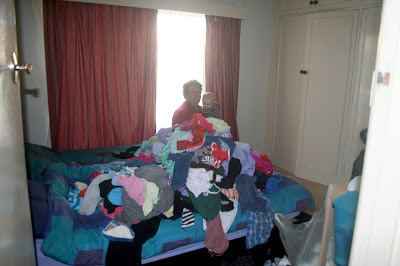 It took us an hour to fold it all and put it away (we were also juggling a tired baby, mind you)... Thankfully, we're all caught up now, so hopefully we won't see Mt Laundry for a long time to come! Oooh nice! 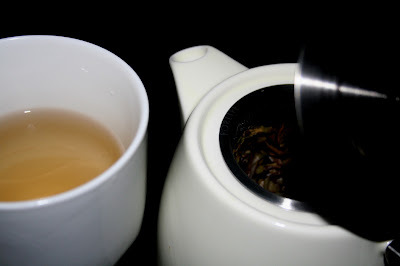 I have a teapot, but like my coffee plunger, it's usually only pulled out for guests :( I LOVE chai.